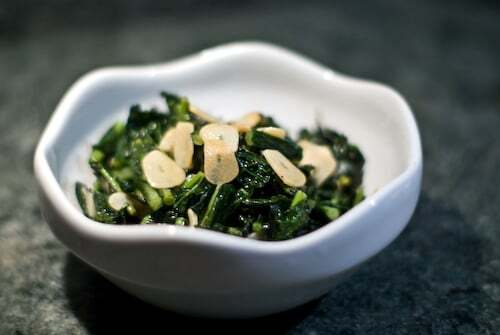 Sauteed Kale Recipe with garlic. A simple way to cook kale without losing the color or nutrients of kale. Most recipes call for cooking kale 30+ minutes, but unlike collard greens, Lacinato isn’t as fibrous and doesn’t need to be cooked that long (you can even eat it raw). A quick saute followed by a 10 minute steam is enough to preserve the green color, flavor and firm texture without turning it into a smelly brown mess boiled in liquid. I also like to use a minimal amount of liquid so all the nutrients don’t leech out into the water. You can turn this into a meal by frying some pancetta with it then dropping a soft poached egg on top and serving it with a thick slice of crusty bread. Or experiment with different spices and aromatics such as sage, chili peppers, or shallots for a different take. If you want to go asian, replace the salt with a splash of soy sauce and the wine with Mirin. Heat a large pot with a lid over high heat until hot. Add a splash of good quality olive oil and then the garlic. Sauté the garlic until lightly browned and fragrant. i have an allergy to Gluten and most of the time i use guar gum or xanthan gum for baking. these gums are good substitute for wheat. this recipe is excellent. I added some sundried tomatoes just before steaming and it was delicious. I just sauteed some garlic, onions and red pepper flakes in olive oil, added kale and big pinch of sea salt…yummy! Man oh man. This is GOOD. I chopped up half a red onion to saute with the garlic, and used about 12 cups lacinato kale. The wine and lemon juice were a perfect flavor combo with the kale. Thanks so much! This looks great! I just <3 your recipes especially your Japanese ones, but sadly I have yet to try any :sadface: But I will, I have over 90% of them bookmarked. We use the same recipe here at home with various veggies, like spinach, broccoli, & broccoli rabe / rapini. We especially <3 it on a chicken francese hero. Quick question, how does Lacinato kale differ from ordinary kale? Thanks! Lacinato kale’s leaves are thinner than regular kale, so it’s more tender (especially if it’s picked young). It’s also more palatable when served raw than regular kale. This was really good. Followed recipe exactly, except added an extra garlic clove. Made as written the garlic burned and ruined the whole dish. Either use a lower temperature or saute it for wayyyyy less than “a few minutes” (seemed to me like it was seriously burnt in 10-15 seconds). Didn’t have white wine so used apple and elderflower juice. Much enjoyed!